A harpist, singer and violinist joined local dignitaries in a bizarre greeting for Mr Trump on a red carpet before he visited the Doonbeg golf resort in County Clare, which he has recently purchased. Mr Trump has promised to create a ‘world-class ballroom’ in a reception area adjacent to the course. Mr Noonan, who is a TD for Limerick, hailed a promise by Trump that “commuter helicopters” would whisk golfing millionaires from Doonbeg course to others he owns in England and Scotland. He also said there was a potential for 300 jobs in total, although it emerged that the positions available are low-wage ‘JobBridge’ supplements for those on long-term unemployment. 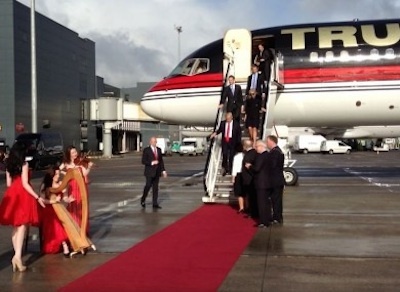 The highly choreographed Trump visit, who flew in on a personalised 757 jumbo jet, appeared intended to draw attention to Fine Gael ‘achievements’ ahead of local and European elections next week. While none of the political parties commented on the scenes, an unusual opinion piece in the mainstream Irish Times newspaper admitted Trump’s golf club purchase was “not worth the bowing and scraping”. “The preposterous welcome conferred upon a man who has done nothing more than help himself to a cut-price property deal was the worst kind of forelock-tugging,” wrote sports journalist Malachy Clerkin. Among the other pre-election announcements issued by Mr Noonan this week was a ‘help-to-buy’ scheme for first-time home buyers. The plan, which is promised to provide state guarantees for certain housing mortgages, will drive up property prices and re-inflate asset values in the state, according to economists. However, with vaulting rents and property prices stretching those who have not participated in either the ‘boom’ or the ‘bounce’ economies, inequality and homelessness remain rampant. And there are new concerns over a planned 3% increase in the ‘Universal Social Charge’ due next January. The increase in the ‘flat’ tax on income introduced by the previous Fianna Fain/Green Party coalition government will mainly affect those who are over 70 or who are in receipt of medical cards. Sinn Fein leader Gerry Adams said the mortgage guarantee plan read like “an extract from the election stunt section of the Fianna Fail handbook of strokes and other scams”. “It doesn’t make any sense at all in dealing with the crisis,” he said. Sinn Fein’s Pearse Doherty said that the new USC charge was a reminder of Fianna Fail’s “ugly legacy” of economic mishandling and, if it goes ahead, is further proof of Fine Gael and Labour’s commitment to the previous government’s policies. “It is time for the Fine Gael and Labour government to stop implementing Fianna Fail’s policies and to ensure that this does not happen. It is not good enough for Minister Noonan to wait until budget time for this matter to be cleared up,” he said.